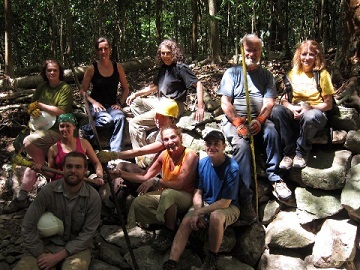 In late February, I joined an AMC Volunteer Crew in the U.S. Virgin Islands. I had long been interested in trail-maintenance work, curious to see what was involved -- and whether or not I'd be up to the challenge of the manual labor. It turned out to bet the best grown-up "spring break" I could have asked for. Our basecamp was the beautiful Cinnamon Bay Campground on the island of St. John, 60% of which is national parkland. The Danish established many sugar plantations on the island during the 1700s and 1800s, on which African slaves were forced to work. (St. John was in fact the site of one of the first significant slave rebellions in this area of the world.) 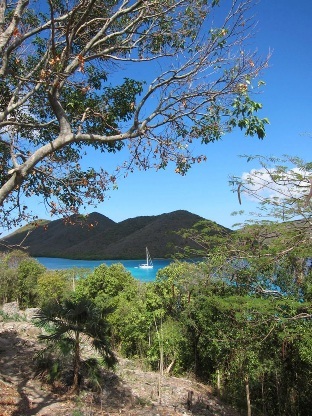 Our project -- a cooperative venture between the AMC Volunteer Trails Program,Virgin Islands National Park, and Friends of Virgin Islands National Park -- was on the site of one such plantation, just off L'Esperance Trail. Because of heavy rains, a whirlpool had formed in a gut, causing an area adjacent to a slave village and burial ground to become exposed and therefore vulnerable to erosion. In fact, human remains and artifacts were visible in some locations near the work site. Our task was to relocate hundreds of rocks from further up the gut and build a retaining wall to allow future rains to wash past, thereby protecting the site. A team of archaeologists worked alongside us, tagging and identifying artifacts and respectfully replacing remains. My fellow volunteers and I were humbled to work on this project, which the archaeologists told us was culturally significant to the history of the island and which had been on their priority list for two years. (hearty thanks to AMC leader Brendan Taylor in particular), and the new friends I made, several of whom I'm planning to see again in the coming months. I would encourage all AMC members to explore trail work through the organization. This trip was fulfilling in ways that I hadn't even imagined when I signed on.